A site was found in the City of Durham that showed continuous usage from the Mesolithic through to the Iron Age. The site took the form of a ditched enclosure with a staggered entrance which had been shored up with timbers during the Bronze Age and Iron Age.Multiple finds were made at this site, including flint tools from the Mesolithic and Neolithic period and Neolithic pottery. The pottery included a rim fragment from a large flat rimmed carinated vessel, decorated with fingertip impressions on the rim. Some kind of organic material was used as an inclusion in the clay; this was burnt out during firing. 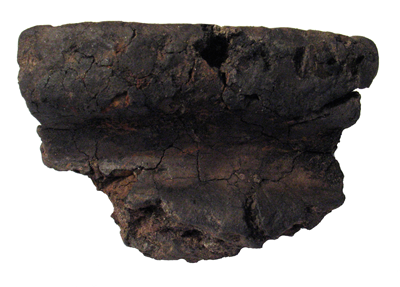 The vessel has been described as being of Meldon Bridge ware, a type of later Neolithic impressed ware found in northern Northumberland and the Scottish Borders. This pottery sherd is important as very little prehistoric pottery has been found in County Durham. Similarly, very little impressed ware has been found across the region. This small piece of rim from a prehistoric pot tells us that people were using the Durham area during the Neolithic, and that people in the area were using impressed pottery. This suggests that there is more prehistoric pottery in County Durham waiting to be found.